And happy election day as well. I’m sure we’ve figured out by now that Barack Obama has been re-elected to a second term. I’m also sure that you’re all sick of hearing about this election, so lets a take a moment to look back in our nations history and honor the first FULL beard elected into office. Yes I’m aware that Lincoln was before Grant, and that Lincoln had a beard. But Lincoln’s beard, a great and unique beard at that, was not a full beard, it was a chinstrap. It took the general who won the Civil war to finally bring the full beard to the white house. A thin but distinguished beard. It showed great authority and commanded respect on the battlefield and in the office. Truly a great beard for a great man, trite and true the beard represents the Red, White and Blue. Today candidates and expected to keep a clean-shaven and clean-cut look to appear slick and professional and it pains me to say that our president can’t even grow a beard (see for yourself here http://www.huffingtonpost.com/2008/12/04/obama-i-cant-grow-facial_n_148545.html). I hope beards somehow make a comeback in the political world but until then lets give reverence to he first of four beards that would make it into the oval office. 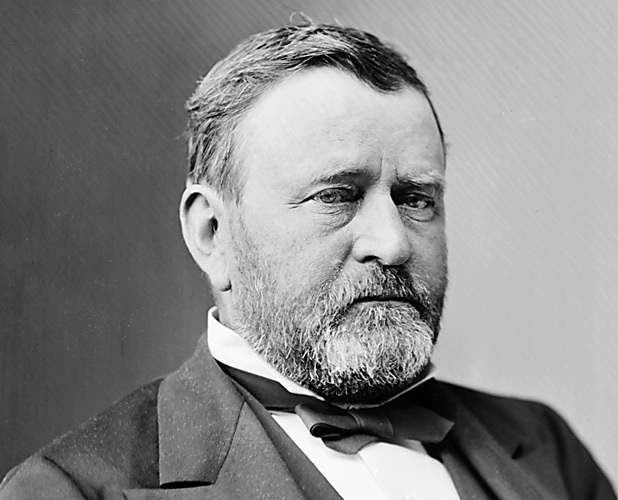 Ulysses S. Grant was the first full beard into the white house and for that, we salute you.